As we all know, the kitchen is THE heart of the home. 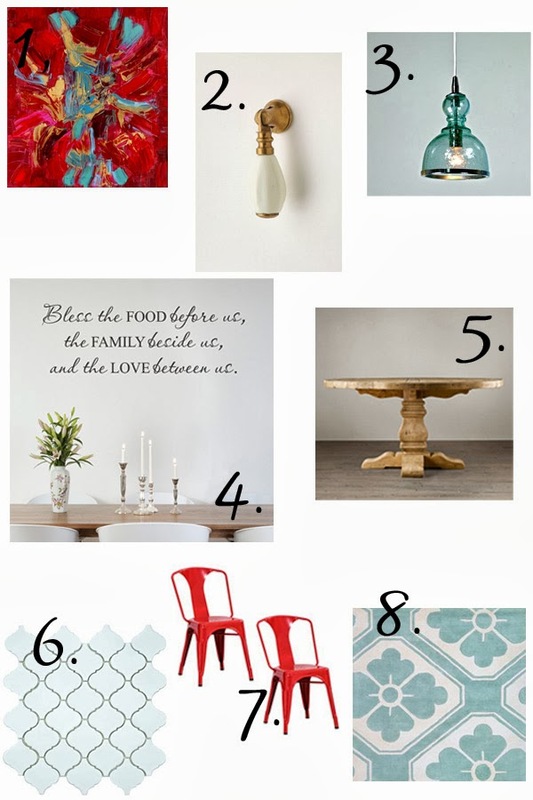 What better way to honor that than with a mood board that features warm, natural woods, fresh color and modern flair? This is a room you'll LOVE to spend time in! 1. The work of Aida Izzedin is the starting place for this space. It's fresh, bold, abstract, and it's a beautiful mix of colors-it's just lovely! 2. Brass is back, and this pull from Anthropologie takes brass to a whole new level. The design is dainty yet impactful...what's not to love? 3. This aqua brass pendant from Shades of Light is fun, functional, and beautiful to look at. Not a fan of aqua? This piece comes in peridot and clear, too. 5. This Restoration Hardware table is beautifully distressed, and the warm wood tones lend a coziness and charm to any space. 6. This Moroccan Mosaic tile is elegant and classic, yet understated. What a gorgeous backdrop for all your kitchen tasks! 7. I know metal chairs are popular right now, but, really, I can absolutely see why! These red metal chairs are industrial, fun, and definitely don't take themselves too seriously. LOVE. 8. This aqua tufted rug from Layla Grayce is functional and beautiful. There's nothing like a rug to cozy up a space, and this one would definitely do the trick! So what do you think? I am partial to these colors in a kitchen right now, but would love to hear what colors YOU love!